She'll be ready for undersea adventure and a real princess party when you fill her day with items from the Mermaid Party Party Supplies list you see here! There are lots of amazing decorations like centerpieces, personalized banners, foil balloons, shape balloons; tableware items like dinner and dessert plates, and fun party favors like favor bags, key chains, bouncy balls, and much more! Put your tail in the air and wave it like you just don’t care. It’s time to party, mermaid style. Gather around the treasure chest and celebrate under the sea! Whether your daughter is a fan of The Little Mermaid or sea life in general, she’s bound to want a mermaid-style birthday celebration. With sea shells, scales and sparkles, what’s not to love about a mermaid party? Find everything you need right in one place, from decorations to activities and costumes. All your little guests will be clam dancing to the beat of the underwater music at your sea splash. Accessorize and decorate the party area, the table and your clothes with sparkles, pearls and seashells to really get an under-the-sea vibe going. Tell the kids to channel their inner mermaid and see who can dress the most festively! Not everyone has time to plan the mermaid part of the year. Browse the Birthday Express Ideas and Inspiration blog to help you throw a party that'll impress kids and parents alike. Visit the blog to find everything from DIY ideas to party favors and games. 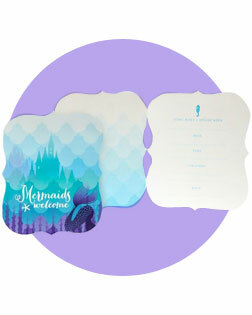 Spread the word and invite everyone to your underwater sea castle with these gorgeous invitations. With one look at these invitations, your guests will know it’s a mermaid party. Tell them to grab a tail and come make a splash at your celebration! The water is perfect for a splish-splash party! Transform the party area into an underwater oasis with all of the party decorations you could imagine. The octopi, starfish, clams, fish and undersea turtles are all ready to join in on the fun! From balloon bouquets to banners and tableware, you can find everything you need to set the scene. Make sure to use beautiful colors like blues, greens and purples. Create an undersea paradise for your little one and all her friends with balloons decorating the entire party area. Use them as a centerpiece or to highlight the guest of honor’s chair. These blue balloons will look like bubbles floating through the water and past all the sea critters! Bring in the perfect party backdrop with a personalized banner. You’ll be able to let everyone know exactly what the mermaid celebration is for! Use it as a photo backdrop or simply for extra decoration. You could even use it in the entryway to let your guests know they’re in the right place. Mermaids love cake, ice cream, cookies and treats, but they need help enjoying them! It wouldn’t be a party without matching mermaid plates, napkins and plastic ware. 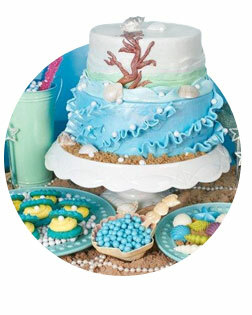 The little ones will love enjoying their party treats along with images of their favorite seaside friends. Get the kids to take action with plenty of underwater-themed games, crafts and photo opportunities. To keep everyone engaged in the fun, set up stations throughout the party area so your guests will always have something to do. Time will fly as they rotate from station to station, enjoying the mermaid fun. You’ll have a blast watching your guests smile and laugh, and the kids will have so much fun they won’t even want to go home. Mermaids are fun-loving creatures who won’t stand being bored. Break out a piñata and watch each little mermaid’s eyes light up with joy. Not only does it provide entertainment, but delicious treats, too! Turn the guest of honor into a mermaid princess with a mermaid costume fit for any occasion. She’ll look stunning as she greets all her friends at the front door, ready to get the party started! Since she loves mermaids so much, you’ll even be able to reuse the costume for Halloween! Whether you want to create a photo backdrop or just need some extra decoration, these wall decals are all about mermaids. Embrace the mythical and magical feelings this sticker set will bring to your party. All you have to do is peel and stick! Aloha! Take some pictures from the shore with this photo booth kit. You can tell the guests to wave to their mermaid friends down under the sea as they pose in front of this fun submarine backdrop. Give your tiny mermaids some take-home treats to make the memories last forever. The other parents will be so impressed by your party-planning abilities when they see how happy their child is at the end of the party! And these party favors will only make it better. 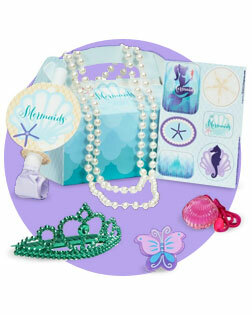 From filled favor boxes to stickers and toys, you’ll have each girl begging her parents for her own mermaid party! Add to the party fun with an under-the-sea themed party favor box. Put in everything a girl could need to transform herself into a beautiful sea creature. The only thing missing is the tail! It wouldn’t be a mermaid party without stickers. Send these stickers home with your guests so they can fix them on backpacks or a water bottle. 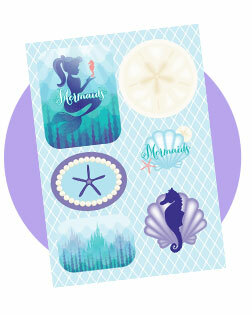 They will always have these stickers as a reminder of your fun mermaid event! Make the party extra special with personalized items. Make the guest of honor feel extra special with her name displayed everywhere throughout the party. From banners to plates and centerpieces, her smile will light up the room when she knows how special she is. Look no further for a truly customized box of treats. Your guests will take their favors home and always remember how much fun they had at your mermaid bash. Teach your little mermaid impeccable manners when you encourage her to send thank you notes to everyone who helped her celebrate her big day. Thank you notes are the perfect, sweet gesture after the party fun settles. You could even pair thank you notes with an extra-fun favor to remind your guests how much their presence meant to your little mermaid!